To make the most of the videos we recommend the Cornell method of note taking. 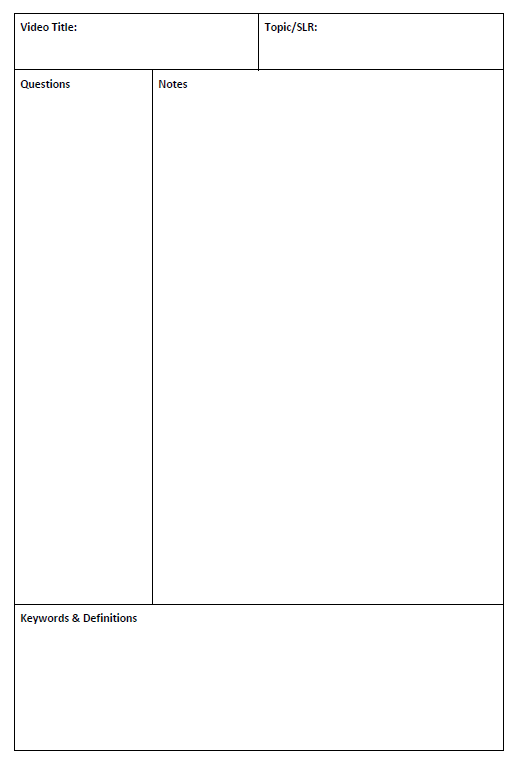 Using an exercise book or Word template, divide the whole page into the sections shown. Use a new page for each video. You will probably have some empty space on each page, but your notes will be better organised. At GCSE, when you see the “make notes” icon, pause the video and jot down into the notes section what you see on the screen. At A’level we have removed this support to better prepare you for university and the workplace. When the canvas changes to the next slide or section, rewind slightly, think about what was important in the previous few minutes and record this. You don’t need a question for every note, just sections that are grouped together logically. Another example might be, “what are the advantages and disadvantages of pipelining?” Here you will have many notes that help answer that question. Finally, in the “keywords & Definitions” section you should record all of the key words from the video that are in your specification. If your teachers are using our workbooks and SLRs in class, these provide a handy reference. Your teacher may also have shared our definitions PowerPoint or revision cards that have simple definitions of the terms for you. Please be aware this is a premium service for schools, so unless your school is a Craig’n’Dave subscriber you will not have access to these additional resources. You will have an organised set of notes. The quality of your notes will be much better and suitable for revision. The information is in a format that suits both short and long-term memory.